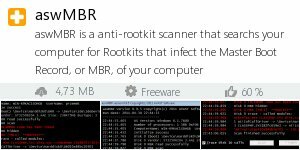 aswMBR is a anti-rootkit scanner that searchs your computer for Rootkits that infect the Master Boot Record, or MBR, of your computer. This includes the TDL4/3, MBRoot (Sinowal), and Whistler rootkits. For this program to properly work it must first download the Avast virus definitions, so you will need an active Internet connection before using it. A rootkit is a malware program that is designed to hide itself or other computer infections on your computer. These types of programs are typically harder to remove than generic malware, which is the reason that stand-alone utilities such as TDSSKiller have been developed. When you run aswMBR, if it is shutdown automatically, then it is most likely the infection detecting that aswMBR is running and terminating it. In this situation you should rename executable to iexplore.exe before you attempt to run it. aswMBR is the rootkit scanner that scans for TDL4/3, MBRoot (Sinowal), Whistler and other rootkits.